Albert Kachellek, aka: Jim Clark (1890-1929) – A gangster working for Bugs Moran, Kachellek fell victim to the infamous St. Valentine’s Day Massacre in Chicago, Illinois. On January 19, 1929, Patsy Lolordo, a gangster working for Al Capone, and his wife, Aleina Lolordo, were murdered in their Chicago home by Albert Kachellek, Pete Gusenberg and Frank Gusenberg, all of whom were working for Capone’s rival, George “Bugs” Moran. 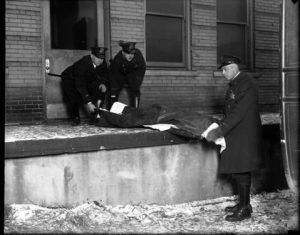 The murders broke a truce between the Chicago mobsters that had been negotiated six months earlier. A week later, the Gusenberg brothers attempted to murder Capone mobster, Jack “Machine Gun” McGurn. Capone then decided to assassinate George Moran and his men. Using a bootlegger to lure the Moran gang to a Chicago garage on Thursday, February 14, 1929, several of Capone’s men entered the garage dressed as policemen, and “arrested” seven Moran gang members. Arriving late, George Moran escaped the “hit” when he saw what he thought were police entering the garage. The Moran gang cooperated with the fake police, since they knew that their boss would bail them out of jail that afternoon. The “officers” then disarmed and lined the men up against the wall. Two more Capone men joined the force and using tommy guns, sprayed the seven Moran men with bullets. The two fake policemen then marched their companions out the garage with their hands in the air to throw off any witnesses and into a car disguised to look like a police squad car. Though Capone had arranged the hit, he had an ironclad alibi and no one was ever charged with the crime. Killed were Albert Kachellek, the two Gusenberg brothers, and four other Moran gang members. Kachellek was buried in the Irving Park Cemetery in Chicago, Illinois.